Retailers are increasingly utilising kiosks as they not only save on rentals, but also helps to expand their visibility and higher sales per sq ft.
Kiosks or stores that range between 25 to 150 sq ft, are increasingly being set up at malls, metro stations, airports and allied locations in large cities, and for a range of product categories. The reason – simple, the investment involved is not large, inventory and marketing costs are not very significant, and an ideal option for those looking to enter modern retail trade. And a range of products, right from cookies, ice cream and beverages, amongst others are utilising this strategy. In addition, cosmetics, beauty products and allied categories, are also increasingly exploring this distribution strategy. In the case of malls, these kiosks are often located on the ground floor to attract maximum attention from consumers, while at airports they are located at the departure lounge. A leading marketing consultant pointed out that the kiosk distribution strategy works well when the purchase decision is often made in a split second, and also does not involve a large amount of money. 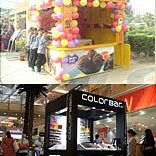 As a result, leading consumer brands like Cafe Coffee Day, Corn Man, Creambell, coupled with beauty retailers like Colorbar, Kaya Skin Clinic and Lakme, have set up kiosks in leading malls, metros and airports across the country.